BCTGM Sec-Treas Steve Bertelli updates the MTD Board about his union’s Nabisco campaign. 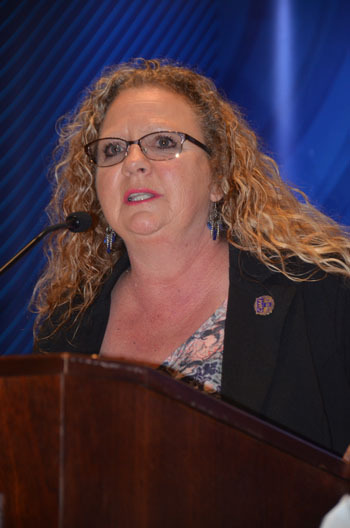 ‘Solidarity’ was the word when officers from three MTD-affiliated unions spoke during the department’s Executive Board meeting February 22 near Orlando. In introducing Bertelli, MTD President Michael Sacco told the audience that his family has been making sure to buy only American-made Nabisco cookies and crackers in support of BCTGM members. The Bakery Workers continue to battle Nabisco’s parent company, Mondelez, over moving American and Canadian jobs to Mexico. Bertelli informed the board and guests that his union is finalizing its 2019 strategy and would keep the MTD informed. CWA VP Lisa Bolton tells the MTD Board AT&T has laid off union members after promising to create new jobs. Like Bertelli, Bolton repeated CWA’s appreciation for the support shown during that union’s 2016 strike against Verizon. “The MTD has always been there for the CWA and we certainly are indebted to you,” she declared. Instead, she pointed out that AT&T “laid off 10,000 people in 2018. They continue to layoff our people and outsource our call centers. They just opened another call center in Mexico with 1,000 people and its looks like they are going to grow that to five [thousand]. Even though the winter federal government shutdown ended, AFGE Sec-Treas Dr Everett Kelley reminds the MTD Board the fight for public employees is far from over. 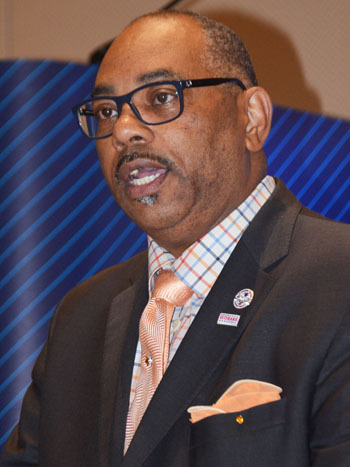 On behalf of AFGE, he thanked the department, its affiliates and its Port Councils for the help provided during the 35-day partial government shutdown. “Although this fight is not over, we are not alone because we have people like you,” Kelley said. “I want to recognize the Maritime Trades and Port Councils for your effortless devotion, donation of food and gift cards, and assistance of our brothers and sisters during the government shutdown. “It is these kinds of acts that make union what it is. It is these kinds of acts that help us understand the solidarity in union. For that, I am forever appreciative. For more than three years, the MTD-affiliated Bakery, Confectionery, Tobacco Workers and Grain Millers International Union (BCTGM) has been engaged in an aggressive national and international campaign to protect the jobs and retirement security of thousands of its members employed at Nabisco, a division of Mondelez International. Through decades of changing corporate ownership, Nabisco’s executive leadership has pursued a corporate strategy of closing and drastically downsizing unionized plants in the United States and Canada, and moving that production to Mexico. With the active support of the Labor Movement – including the MTD – and progressive organizations throughout the U.S., the BCTGM launched a campaign to educate the public and consumers about the company’s anti-union and immoral actions. The union launched a “Check the Label” campaign to educate consumers about the importance of purchasing Nabisco products made in the United States and rejecting Nabisco products produced in Mexico. The BCTGM then initiated the “Nabisco 600” speaking tour, featuring laid-off workers from Nabisco’s Chicago bakery telling their personal stories to concerned citizens, union members, retirees, college students and religious organizations about losing their good, middle-class jobs. 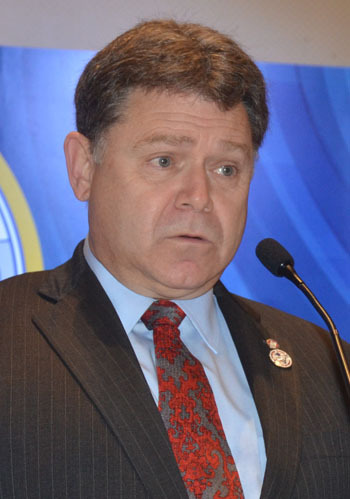 In March 2017, the AFL-CIO Executive Council – citing the high-profile brands of the company, the current political environment that has shed light on the inequities of unfair trade deals (including NAFTA), and the company’s blatant attack on unionized workers – voted unanimously to designate the BCTGM’s Nabisco campaign as its first “Solidarity” campaign. In 2018, during national negotiations on a new collective bargaining agreement covering nearly 2,000 workers at Nabisco bakeries in the United States, the company illegally withdrew from the multiemployer B&C Pension Fund. This egregious action by the company, which has been a part of the B&C Pension Fund since its inception more than 60 years ago, threatens the retirement security of thousands of Nabisco/Mondelez retirees and active employees. In part because of Nabisco/Mondelez’s attack on the union multiemployer pension plan, the BCTGM is actively engaged in the effort to support comprehensive federal legislation that would provide solvency for multiemployer pension plans. The BCTGM’s Nabisco campaign has achieved extraordinary success to date. The foundation of this success is labor solidarity. Ultimate victory for the BCTGM in this campaign will be a victory for the entire Labor Movement, and workers at all multi-national corporations that seek to outsource good, middle-class union jobs and/or eliminate the retirement security of its dedicated workforce. The MTD, its affiliates and its Port Maritime Councils reaffirm our unwavering support for our Sisters and Brothers of the BCTGM in its campaign against Nabisco/Mondelez. The Maritime Trades Department, AFL-CIO, its affiliates and its Port Maritime Councils strongly support the efforts of thousands of workers employed by AT&T Legacy T and AT&T Midwest to win the jobs and employment security that the company and politicians promised them. In 2017, Congress passed and the President signed the Tax Cuts and Jobs Act. The measure’s supporters promised that this bill, which slashed corporate taxes, would end the offshoring of jobs and give every household a $4,000 raise. AT&T lobbied for its passage as well as promising 7,000 jobs for every $1 billion it received in tax cuts. After the bill became law, big corporations like AT&T experienced a massive windfall in tax benefits. Starting in 2018, AT&T received a $3 billion annual increase in cash profits due to the Tax Cuts and Jobs Act. Instead of creating the jobs the company promised, AT&T has cut more than 10,000 union jobs since the tax cut was enacted. Instead of ending the offshoring of jobs, AT&T continues to maintain call center operations in places like the Philippines where workers earn $1.60 per hour. In addition, the company opened a 1,000-person call center in Mexico and expects to expand that center to 5,000 jobs. AT&T workers in the U.S. are demanding answers. The Tax Cuts and Jobs Act has failed on its own terms. Corporations took the windfall while American workers continue to lose good, middle-class jobs, especially in the Midwest. It is time for answers. Congress should conduct rigorous oversight of this tax-cut swindle. It is time for Congress to investigate companies like AT&T and demand to ask: ‘Where are the jobs?’ The American people deserve answers. And AT&T employees deserve a fair contract with the jobs that were promised. The MTD, its affiliates and its Port Maritime Councils will continue to stand in solidarity with our CWA Sisters and Brothers fighting for just and fair contracts at AT&T. When we met last year, many MTD-affiliated unions whose membership includes public sector employees were awaiting the Supreme Court’s Janus v. AFSCME Council 31 decision. As had been suspected, the high court struck down the ability of unions to collect agency fees to cover administrative and legal costs incurred by a local or district from those workers covered by collective bargaining but choosing not to join. Many a pundit predicted the ruling would place a nail in the coffin of the Labor Movement. As we have seen throughout our history, never underestimate the power and strength of workers when they are riled. Membership in the internationals that were supposed to suffer actually has increased. Young workers – seeing how their parents’ income has stagnated through the decades – are forming their own locals at workplaces. We have seen teachers come together in various states to gain support for much-needed classroom improvements. The MTD, its affiliates and its Port Maritime Councils have been part of “RedforEd” and “RedforFeds” movements. Now, we are recovering from the latest attack on public employees – the historic 35-day partial shutdown of the federal government. Just before Christmas, approximately 800,000 men and women from departments as varied as Transportation, Treasury and Homeland Security were either sent home or declared essential and forced to work without a paycheck. In addition, hundreds of thousands of contract workers also felt the sting of not having a job during the shutdown. Media covered such stories as TSA officers sleeping in their vehicles at airports because they did not have the money for fuel to travel home to Coast Guard personnel turning to food banks to feed their families. In our industry, mariners could not acquire or renew needed documents in order to claim their jobs because the National Maritime Center and its Regional Examination Centers were closed. The MTD is proud of its many Port Maritime Councils who came to the aid of their Brothers and Sisters in need. Efforts included the South Florida and Michigan Port Councils providing grocery gift cards for Coast Guard families, while the Hawaii Ports Council not only participated in a solidarity march through the Honolulu airport but also organized a drive-through food bank for furloughed federal workers. Since funding was restored, federal workers are trying very hard to return to a normalcy in their lives. Yet, contracted workers still have no recourse to cover their missed paychecks. While the shutdown was underway, teachers in Los Angeles hit the bricks to call attention to poor conditions in their public schools. Community support was essential in gaining their victory after six days. We give a shout-out to our Southern California Port Council who adopted a local elementary school to provide water, food and moral support for the striking teachers as well as the students and their families. What has happened over the past year demonstrates yet again that public sector workers are a very vital part of their communities – be it at the local, state or federal levels. They are dedicated and proud of what they do. The MTD, its affiliates and its Port Maritime Councils continue to stand with our Sisters and Brothers in the public sector. We urge the White House and Congress to work together to fund the federal government and not hold workers hostage. We join with others in the Labor Movement in calling for contracted workers affected by the most recent federal shutdown to recover their lost wages. And, we support our teachers and local public employees as they fight to improve and upgrade schools and other valuable community needs.